As a game, LittleBigPlanet 2 was all about motion and physics. It was a Rube Goldbergian dream diorama, a series of flipping levers, bouncing springs, swinging doorways and tumbling blocks. The game had a heavy thunkiness to it that unfortunately was its undoing in the gameplay department—it was so dependent on its physics engine that the basic platforming never felt quite right, and didn't come close to the kickass bounce of Super Mario 3D Land. Wow, I couldn't have said that better myself! As much as I enjoyed the disparate licensed tracks in LBP2, I liked the original score just as much if not more. Awesomely, much of the licensed music is assembled over at the "Littlebigland" website, which frees me up to talk more about the score, specifically the work of Winifred Phillips. Well, let's just start with my favorite track from the whole game. "Victoria's Lab" pops up early in the game, and it was from this moment on that I realized that LittleBigPlanet 2 was going to do a whole lot more for me than its predecessor had. The music is great on its own, but in the game it does this very cool thing where depending on where you are in the level, it layers and builds until it climaxes during the final few parts. The tunes all appear to have been broken down into a series of layer-able sections, and the layers are automatically added as players progress through each level. For example, this track starts with the simple beat, and not much else—if you hop around the beginning of the level, you'll hear that same simple beat until you decide to move onward. Then, the music grows in complexity along with the level, and right when the beat drops, you're making your way through these crazy robot enemies and dodging deadly flooring and the entire thing is rocking like a Wile E. Coyote contraption. This video, meanwhile, is hilarious and amazing—it looks to have been created entirely with in-game assets. Whoever did this had a lot of fun; I could watch it all day. Which brings us to another favorite track, "Eve's Asylum," which is also another of Phillips' compositions. This one suffers a bit when played straight-up as a song, since my favorite part is the very first 30 seconds or so. In the game, that part loops, just this gorgeous chord progression echoing through the darkness. 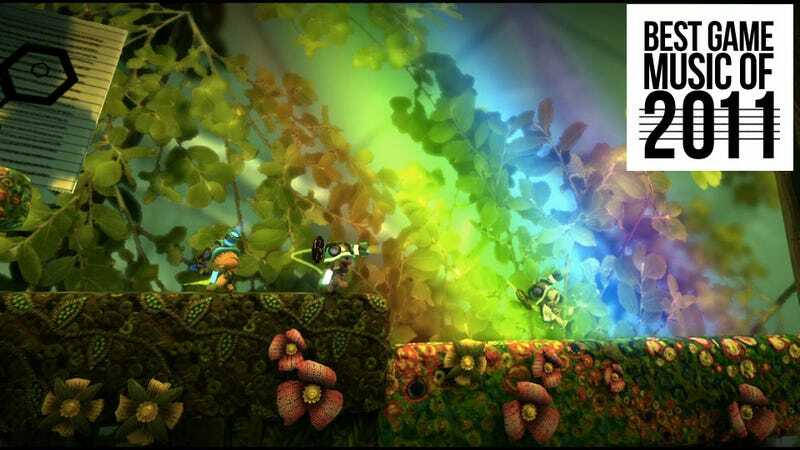 It accompanies the level "Fire Flies When You're Having Fun," which sees Sackboy/girl jumping through a darkened cave lit only by giant flickering fireflies. It was one of the most gorgeous things I saw in gaming this year, and I didn't want it to end. I do want to recognize one licensed track—the tune "Infotain Me" by the band Ochre came to represent a lot of LittleBigPlanet 2, partly due to the marketing campaign, but partly just because it's a great song. It matches that LBP vibe: mellow and thoughtful, brainyness with a hint of transcendence. This is a tune you listen to while riding the train after leaving a phase of your life behind, a song designed for fleet shadows and time-lapse footage of the setting sun. It's epic, is what I'm saying, and in a way that is entirely in lockstep with LittleBigPlanet 2's peculiar breed of humble, handmade ambition.